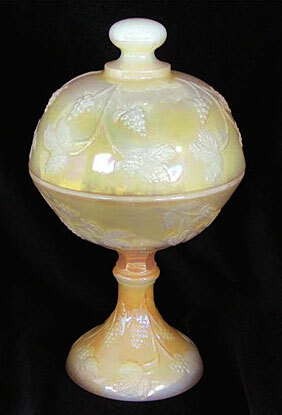 While the original moulds for the Dewberry, aka Blackberry, pattern were made by the Co-Operative Flint Glass Co, these “caramel lustre” examples were produced by Phoenix. (Westmoreland and Kemple also made some Dewberry reproductions.) They sold at a Mickey Reichel auction in 2010. The covered compote brought $50, the covered sugar $28, and the creamer $18. 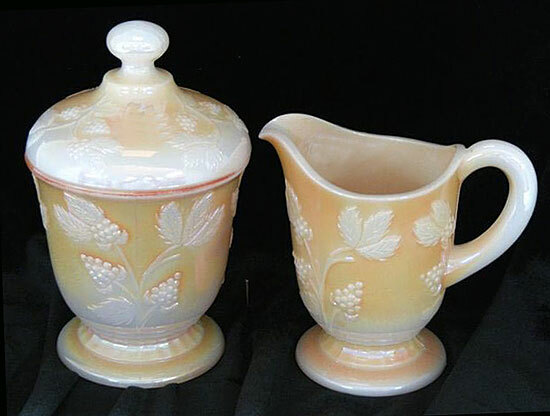 A water pitcher, also in marigold on milk glass and listed as this pattern, brought $200 in 2009. 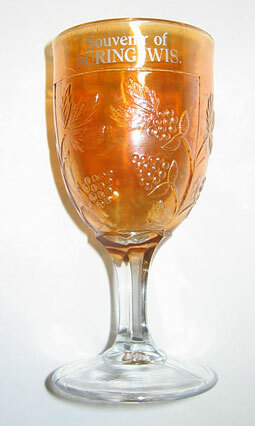 This marigold wine glass in the Dewberry pattern has souvenir lettering. Courtesy of Carl and Eunice Booker.